XBLAFans was able to sit in on a conference call last week with Guardians of Middle-earth Producer Bob Roberts and Senior Producer Ruth Pomandl. They shared intricate details about the game’s development process, what it was like to balance a MOBA (multiplayer online battle arena) game for the console space and some details about how various systems will work in the game. Enchanters –- low maximum health and low physical damage, but they output lots of ability damage and withstand ability damage better than other classes. Defenders –- high survivability but low damage. Warriors –- the most balanced class and the most versatile as a result. They take a fair amount of damage and deal a fair amount in return. Strikers –- the physical damage equivalent of Enchanters, meaning lots of damage but very low survivability. Tacticians –- slightly more survivability than average but focus on AOE disruption and controlling the flow of movement across a lane. In most PC MOBA games, players shop at an item store for items to upgrade their characters as the game progresses. Guardians mixes things up by introducing a less UI-intensive series of systems that should help make the console experience go more smoothly. Players can set loadouts similar to League of Legends rune and mastery systems before a game begins, except that the loadout options in Guardians are even more extensive. There are three loadout systems in place for players to manage and utilize throughout a game — Potions, Commands and Guardian Belts. 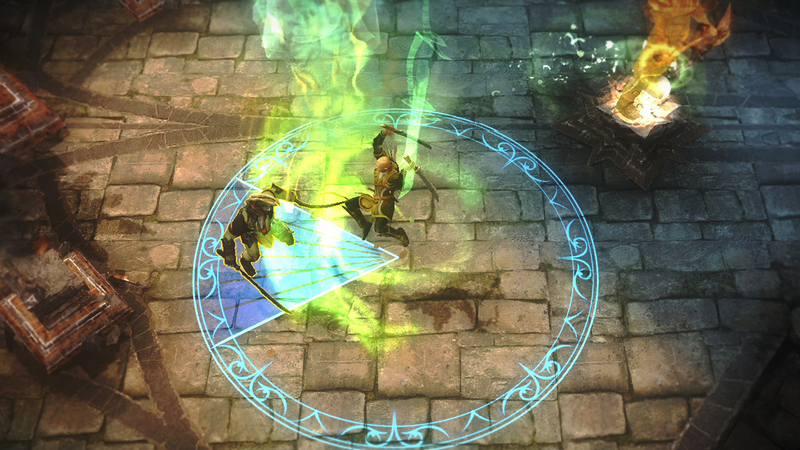 Potions are one-time use items that provide temporary boosts to certain statistics at key moments in a match. 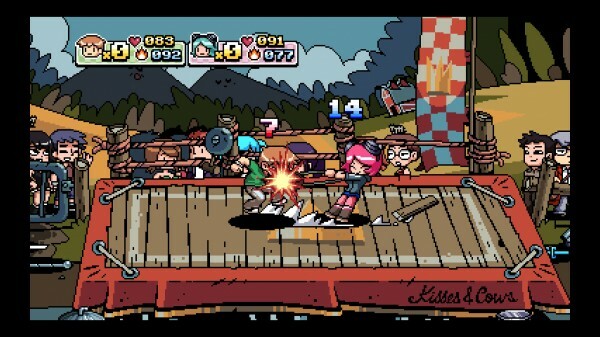 For instance, a player could consume a potion that temporarily boosts their movement speed in order to chase a fleeing enemy or to more safely disengage a battle. Other examples of stats that can be affected by potion use include health regeneration, attack damage and defense. There are 88 potions in total, and players select four of them as part of their loadout — there are a lot of customization options here in selecting just four of the available set of potions each game. Commands are super-powerful extra abilities that any Guardian can take once they unlock them through leveling up their profiles in-game. They are on longer cooldown timers than most abilities — how often a player is able to cast them depends on the strength of the effect. For instance, low cooldown Commands might include a clutch healing spell or a burst of speed; the more powerful Commands, such as summoning a Balrog or Felbeast onto the field to fight alongside you, have a significantly longer cooldown, to help balance out their more significant impact on the game. Guardian Belts are the real meat of the loadout customization. Guardian Belts serve as the replacement to item stores in other popular MOBA games such as DotA 2 and League of Legends. The Guardian belt has seven slots, each of which is filled with powerful relics and gems. These slots on the belt are not active at the start of play — instead, as players level their characters during the course of a single game, the slots will slowly begin to unlock. Relics take up various amounts of slots (ranging from two to four), and they don’t become active until all of the slots taken up by a particular relic are unlocked by leveling your character. The system allows for a significant amount of customization. If, for instance, you are building a team focused around the early game, slotting a two-slot relic at the beginning of your Guardian belt will allow you to have a big advantage over players who slot the larger three and four-slot relics until those players reach later stages of the game. Similarly, if a team focusing on the late game stocks three and four-slot relics and successfully holds off the opposition until the entire belt unlocks, they will be at a big advantage towards the end of the game. All of these systems enable significant manipulation of character roles. It’s possible to tweak Gandalf to become a giant “glass-cannon” Enchanter by creating an entire loadout focused around dealing large bursts of damage if a player wants to focus on outputting damage at the expense of other stats. If instead a player would prefer to increase Gandalf’s chances of surviving over the course of a longer team fight, then it is possible to help make up for Gandalf’s low HP by choosing healing Commands and defensive Guardian Belt relics. The statistics that the Guardian Belt relics grant seem to run the entire range of MOBA stats and then some. Cooldown reduction, spell penetration (the power to make spells ignore magical resistance), health, defense — it’s all there. The developers did warn that while there is a very large amount of flexibility, it is not limitless — Gandalf will never be as defense-oriented as the shieldmaiden Eoywn, for example. That being said, the opportunity to capitalize on strengths and cover weaknesses seem to bring a lot of variation to the table — it will be very exciting to see these systems in action when the game releases next month. Players can save up to 10 custom loadouts — 10 different combinations of Potion, Command and Guardian Belt settings so jumping into multiple games with different styles of characters won’t take a long period of time. All of these systems have many layers of complexity. New players can choose from pre-established “Starter” loadouts that are surprisingly viable choices, even if a new player is playing alongside (or against) an experienced player with access to the full loadout options. As the game develops and players become more skilled, however, most will want to utilize the deep customization options the game makes available to them. Another method by which the developers hope to get new players into the game is by introducing a significant glossary of MOBA terms and numerous tooltips, including basic information on how to play each of the Guardians. New players shouldn’t worry about facing experts their first game either, as there is a matchmaking system that helps to ensure players face opponents of approximately equal skill. Finally, there was one detail that has implications that reach further than Guardians of Middle-earth alone. For readers not familiar with MOBA games, they receive a lot of balance patches; for example, League of Legends is usually patched once every two weeks. When asked how they were able to work with Microsoft to help ensure quick certification of future patches to help maintain their online community of players, WB Games representatives responded by saying that they can change numbers in their balance database (numbers such as how much damage a certain character’s fireball spell does or how powerful a certain relic is) without having to go through certification. This is extremely good news for XBLA gamers — hopefully other developers are permitted to set up similar databases for their own games when it makes sense to do so. Imagine playing a version of Street Fighter that Capcom could tweak and balance on a monthly basis as the result of tournament play, for instance. The possibilities seem endless here, and since Microsoft was willing to work with WB Games and Monolith to help ensure as high-quality a MOBA game on XBLA as possible, it would be nice to see them show the same courtesy to other developers in the future. The development team is very proud of the work they have done on bringing the MOBA genre to the console space. 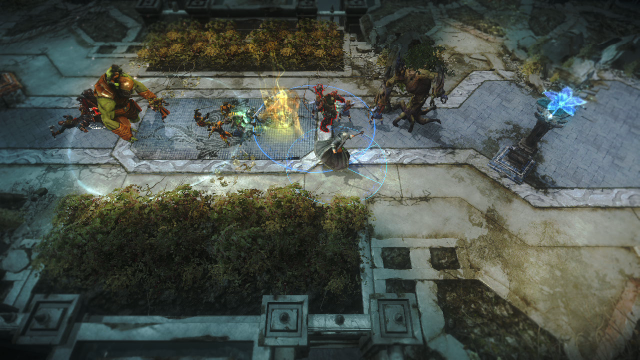 When asked about why they chose not to simultaneously release Guardians of Middle-earth on the PC, they responded that multiple aspects of the game design are focused around the console interface. The developers suggested that even if they had an unlimited budget from which to work, if they had split their focus between console and PC, then neither would have been as successful. Thus far, everything they had to share with XBLAFans was extremely exciting — if these systems work as well as they suggest, Guardians of Middle-earth may well be one of the most exciting XBLA releases yet.